Branch pipe in aluminum alloy, equipped with pistol grip. The specially shaped handle makes it possible to open and close the nozzle in a dosed manner. The beam can be smoothly adjusted from full beam, flash-over and spray jet by turning the head. 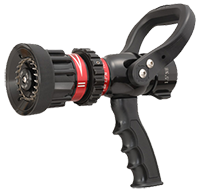 Equipped with a rotating tooth ring.Excellent for AFFF foaming agent.